For Lithuanian startups, the year of 2018 was especially bright and promising: according to the Head of “Startup Lithuania” startup ecosystem development division of “Enterprise Lithuania” Roberta Rudokienė, high hopes are boosted not only by the growing number of startups, attracted record-breaking investments but also by the large corporations that turn to startups and the funds of business angels complementing the ecosystem. In this context, Kaunas startup community stands out as a network of active startup organizations, having a strong base of deep technologies. Last year has proved that Lithuanian startup ecosystem is unfailingly growing: at the end of 2017, “Startup Lithuania” had 380 startup companies in its database, and at the end of 2018, the number reached 506. Not only the growing figures are gratifying: as the trends observed by “Startup Lithuania” show, large corporations are turning to the startup ecosystem. Recently, SEB Bank has opened an innovation center, announcing that it will invest 2 million euros in startups from the Baltic States; Swedbank has introduced its Open Banking Sandbox platform, inviting creators of innovative ideas to join technical documentation and BETA version of the platform. What is more, ESO has opened electricity distribution networks to innovation developers, “Creditinfo” has announced their collaboration with startups, SBA would also be interested to invest in them and so on. The startup community is joined by the Lithuanian Business Angels Network, established in 2018, which helps innovative young businesses get investment at the very early stages of their activity, during the most difficult time. Another important news for startups this year: two new accelerator funds “Startup Wise Guys” and “70 Ventures” will not only invest in startup companies but also provide business acceleration programs. There is more and more news about impressive investments attracted to startup businesses. In 2018, Lithuanian startups attracted a record-breaking amount of investments – over 183 million euros. Most of that amount was drawn from foreign investment funds. From the perspective of startup fields, there is recent increase in fintech: according to the Head of “Startup Lithuania” Roberta Rudokienė, this is highly influenced by the activity of the Bank of Lithuania, a favorable regulatory environment and the state-wide policy of showing Lithuania as a financial technology leader. Another notable trend is the use of popular technologies: from block-chain to artificial intelligence. 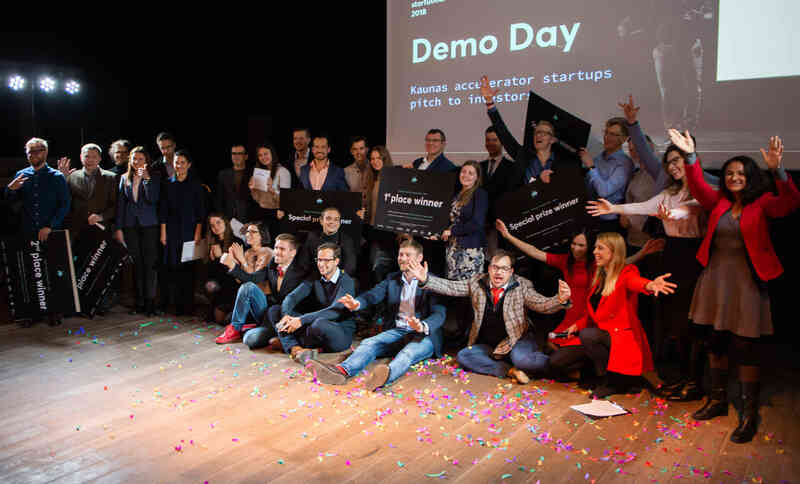 The year of 2018 was a real breakthrough for Kaunas startups ecosystem: the first accelerator in Lithuania was held in the interim capital, the startup community was very active – relevant topics were discussed during dozens of discussions, seminars and presentations; high-level mentors, investors and experts from Lithuania and abroad came to Kaunas; the most innovative startups were awarded. “These initiatives helped startups to get investment proposals, attract new employees, change or outline their position and business plan”, says Project Manager at “Civitta” Jonė Vaitulevičiūtė who works with startups. “2018 gave a very strong impulse to Kaunas startup community, drew investors’ attention to Kaunas, and the city itself appeared on the map of startup ecosystems. One of the most prominent startups of Kaunas last year undoubtedly is “BrachyDOSE”, developing a system that helps to ensure the quality of treatment during radiotherapy procedures. Another star of the year is Kaunas startup “Helis”, which in December was bought by other fast-growing startup from Lithuania “Tesonet”. Vaitulevičiūtė notes that Kaunas startup ecosystem is not typical: Kaunas startups are usually characterized by a very strong foundation of deep technologies and they receive a huge help from a big network of organizations who are actively supporting and growing startups in this field.